To build on the work already underway to fight the effects of climate change, Ontario is laying a foundation to join the biggest carbon market in North America by introducing new legislation today that, if passed, would ensure that proceeds from the province’s cap and trade system are transparently reinvested into green projects and actions that will reduce greenhouse gas pollution. The Liberal Green Shift plan is as powerful as it is simple: We will cut taxes on those things we all want more of such as income, investment and innovation. And we will shift those taxes to what we all want less of: pollution, greenhouse gas emissions and waste. I wasn’t opposed to that – I didn’t know it would accomplish much of anything, but a carbon tax instead of a payroll tax, or a beer tax, is not something I would get too worked up about. However, I have written on two objections to a carbon tax: the inability to price externalities, and the funding of thoughtless spending with revenues. For those that haven’t been following the Wynne government’s raid of electricity assets, a quick refresher is in order. A new joint study by the Consumer Policy Institute and Energy Probe shows residential power prices in Ontario have increased at the fastest rate in North America. Ontario’s IESO, nominally responsible for the operation of Ontario’s electricity system, reported for the 3rd quarter of 2015 there were 2,006.2 MW (megawatts) of contracted “Solar” capacity in commercial operation. The United States has slightly more than 20,000 megawatts (MW) of solar generating capacity, which includes utility-scale solar photovoltaic (PV) and solar thermal installations, as well as distributed generation solar PV systems, also known as rooftop solar. Only California clearly has more installed Solar than Ontario, with second place Arizona about equal (2,103 MW) and New Jersey a very distant fourth (U.S. third). Very few Ontario residents would know about the comparatively large amount of solar in the province because the IESO’s poor reporting is amplified by the province’s media. The IESO reported only 0.25 TWh (million megawatt-hours) from solar in summarizing 2015’s generation, which ignored the 88% of contracted supply not connected to the transmission grid they administer – but which they did contract. 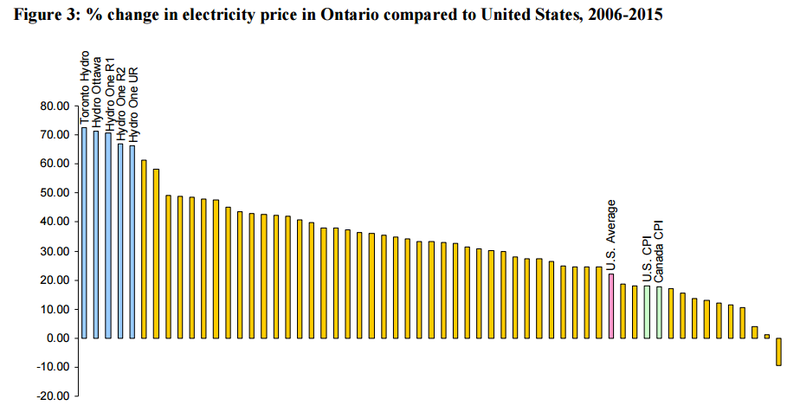 The Toronto Star amplified the information as an error, beginning a “Q & A for Ontario’s hydro system” by misinforming readers that the “less than 1 per cent” (sic) referenced the share of Ontario’s electricity. Retired Toronto Hydro employees called on agencies mandated to protect the public interest to investigate malpractice at Toronto Hydro only to be stonewalled. Tom Adams’ Ontario Electricity Regulation Crisis Report Part 125 Guest Post: Stonewalled by Guardians demands reading – it’s about Toronto Hydro, but I fear its applicable to most things connected with Toronto. On a personal note, some readers might recall that I had a long history as an advocate for the break-up and privatization of Ontario Hydro. The most articulate and energetic advocate for public power on the other side of that debate was Paul Kahnert, then a union activist with CUPE Local 1 and a Toronto Hydro employee. My adversarial engagement against Mr. Kahnert arose from his role as the spokesperson for the Ontario Electricity Coalition whose provincial campaign and court case stopped the sale of Hydro One in April of 2002. As I came to realize that Fiona Crean, then the City Ombudsman (now the Hydro One Ombudsman), was stonewalling my request for an investigation of the Union Street blackout and other major events of operational failure due to Toronto Hydro’s negligence after Crean lead me on, I also learned that Mr. Kahnert was spearheading a similar initiative. If you compare the timing of the Kahnert/Grant initiatives with my posts 122, 123 and 124 of this series, you will see that I was, in fact, following in their footsteps. Although we were familiar to each other previously, it wasn’t until this event that Mr. Kahnert and I realized that we were in many ways kindred spirits, sharing many objectives for an electricity future Toronto can be proud of. As we have become friends, Mr. Kahnert never tires of reminding me that consumers were far better off before the break-up of Ontario Hydro than they are now. He’s right.